Here is a look at some of this week’s top high school sports events. Tuesday — Bud O’Dea Classic at Desert Breeze Park, 3:15 p.m. The annual freshman-sophomore classic gives the area’s younger runners a chance to shine. Saturday — Lake Mead Invitational at Veterans’ Memorial Park, Boulder City, 8 a.m. This is the final big invitational meet before the postseason league meets, and should feature many of the area’s top runners. Friday — Spring Mountain at Pahranagat Valley, 7 p.m.
A rematch of last year’s Class 1A state title game where the Golden Eagles snapped Pahranagat Valley’s 104-game win streak. Friday —Virgin Valley at Moapa Valley, 7 p.m. The “Battle for the victory hammer” always is intriguing, but the winner will have the inside track to the Class 3A Sunrise League title. Friday — Durango at Sierra Vista, 7 p.m.
Bishop Gorman gets all of the attention in the Southwest League, but the Trailblazers and Mountain Lions both are undefeated in league play. The winner should claim a home playoff berth. Friday — Faith Lutheran at Shadow Ridge, 7 p.m. The Northwest League is loaded, and this game could go a long way toward determining playoff position. The Crusaders have won three straight after an 0-3 start and sit at 3-1 and in second place in the Northwest. Shadow Ridge is 2-1 in league and tied for third. Friday — Legacy at Arbor View, 7 p.m. The Aggies look to remain undefeated in Northwest League play against the Longhorns (4-2). Friday — Basic at Green Valley, 7 p.m.
Bishop Gorman (313) finished nine strokes ahead of second-place Palo Verde to win the Class 4A Sunset Region last season. Will the Gaels be victorious again on the loaded Sunset side? Coronado junior Victoria Estrada was last year’s individual state winner and should help the heavily favored Cougars win their fourth straight Sunrise title. Boulder City’s Lani Potter will look to win her second consecutive region title, and looks to lead the Eagles to a second straight team crown. Tuesday — Bishop Gorman at Spring Valley, 3 p.m.
What may be a mismatch on paper, could be an intriguing matchup. The Grizzlies lost by just a goal at the No. 1 Gaels’ field earlier this season, and Spring Valley made a surprise run to the Sunset Region title last year after finishing third in the Southwest League. Friday — Sunrise Mountain at Cimarron-Memorial, 3 p.m. The No. 4 Miners are the only team in Southern Nevada without a loss or a draw, and travel to play a strong Class 4A team in the Spartans. Monday — Centennial at Faith Lutheran, 5:30 p.m. The No. 5 Bulldogs host the No. 10 Crusaders with Faith Lutheran fighting for a playoff spot in the Northwest League with Shadow Ridge looming right behind. Tuesday — Moapa Valley at Virgin Valley, 5:30 p.m.
Rainee Brito is making a run at the Class 3A scoring title, and will look to lead the Bulldogs team against a Pirates team ahead of them in the Class 3A Sunrise League standings. Saturday — Individual region tennis championships at Darling Tennis Center, 8 a.m. The championship singles and doubles matches in the Class 4A Sunrise and Sunset Regions will be at 8 a.m., followed by the Class 3A title matches at 10 a.m.
Wednesday — Faith Lutheran at Durango, 6 p.m. The Trailblazers are one of only two undefeated teams in Class 4A Sunset Region play. A win here would be massive for Durango, which must finish its season against powers Centennial, Bishop Gorman and Shadow Ridge. 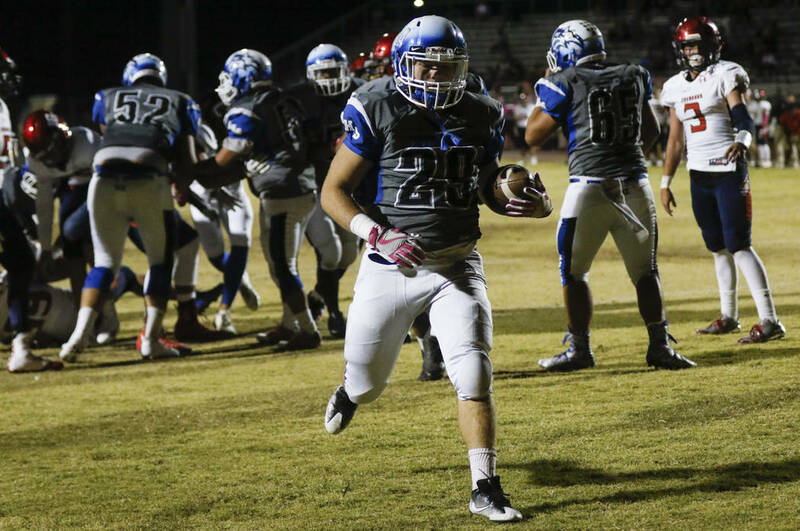 Thursday — Sierra Vista at Palo Verde, 6 p.m. The top three spots in the Sunset Region are all but set with Bishop Gorman, Durango and Shadow Ridge. The remaining five seeds, however, are still up for grabs and these teams know they must play well down the stretch for better playoff placement.